We got off to a great start – it’s a good thing Melanie arrived early. I’m pretty sure everything that could go wrong did – including baffling technology issues. However, we did not let that damper our spirits as we prepared to work with the students to start their artwork. Today was mostly informational. The students got to meet Melanie and hear some great information. The Art 2 and Art 3 classes discussed different kinds of sculpture – public sculpture, memorial sculpture, minimalist sculpture… the list goes on for a while. Then Melanie had prepared a power point that highlights wood sculpture (since that is the medium we have to work with) as well as different ways the wood could be treated, stacked, piled and so much more. She ended with a look at traditional and then nontraditional memorial sculptures. We ended those classes thinking about what the students want to say with their sculpture and which elements of art/principles of design they wanted to focus on. Tomorrow they will share their sketches with one another and begin collaborating. 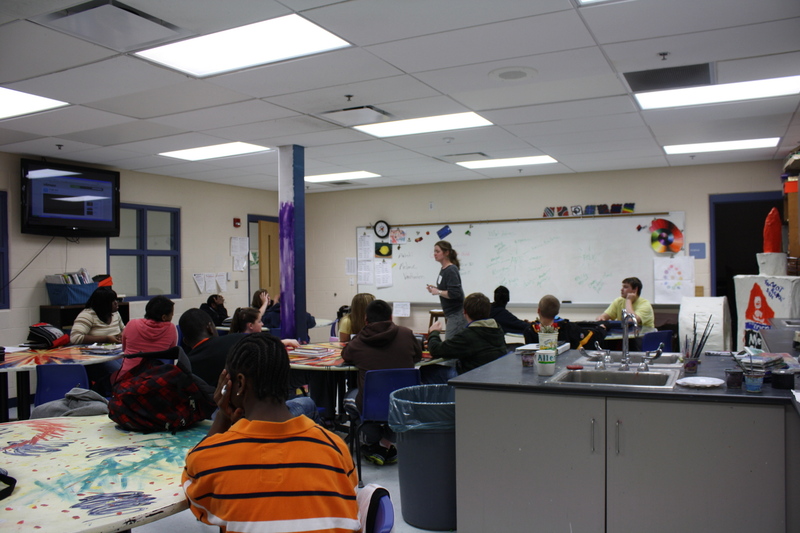 Melanie discussing folk art with some middle school students. The middle school and Art 1 classes focused on folk art (side note: one group will do this lesson tomorrow). They discussed the terms by themselves (art and folk) and then tied them together. They watched a short video clip of different people defining/describing folk art. Then they looked at examples of sculptures by Joseph Cornell – an artist who often used small objects in boxes to tell stories. Google his artwork – it’s interesting. The students will be creating their own memory box that tells their story. They have already completed a family history interview of at least one relative and brought in shoe boxes – it should be great to watch them begin to create stories of their lives this week and then finish them up the week after spring break.